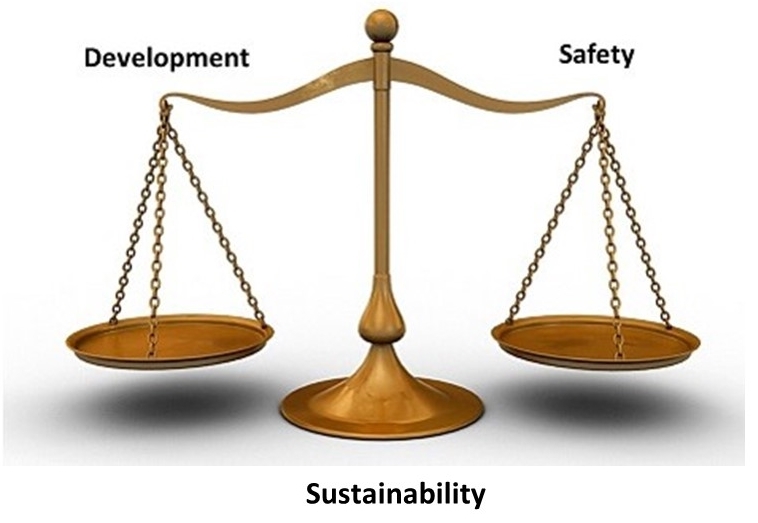 According to Wikitionary, nanosafety is all the safety issues associated with nanotechnology. Despite the fact that nanotechnology has been around for over 20 years, it is still considered new technology and with many new technologies, the health effects of nanomaterials have not been thoroughly investigated. Consequently, the uncertainty surrounding the toxicity of nanomaterials merits a cautious approa ch when working with them. For this reason, discussion on nanosafety will often deal with toxicology, ecotoxicology, exposure assessment, mechanism of interaction, risk assessment and standardisation. The European Union have in the past few years focus their program activities to look at safety of manufactured nanomaterials. Thailand on the other hand is addressing nanosafety concerns in manners that embraces harmonization and enhances the overall goal of technology development. Technology development and safety awareness need to complement each other in order to achieve sustainability of technology development. 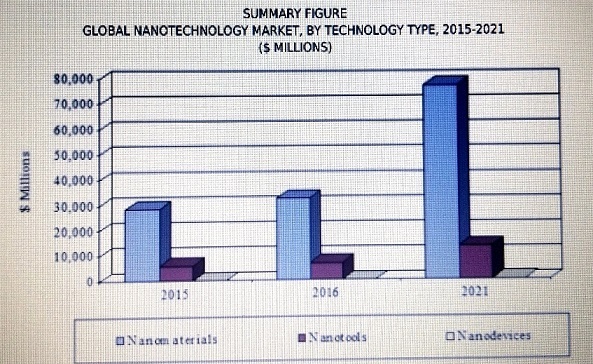 According to report by BCC Research (published Nov 2016), the global nanotechnology market should reach $90.5 billion by 2021 from $39.2 billion in 2016 at a compound annual growth rate (CAGR) of 18.2%, from 2016 to 2021. It is without a doubt that nations are focusing their attention to the progress of this technology. Nanotechnology is helping to considerably improve, even revolutionize, many technology and industry sectors: information technology, homeland security, medicine, transportation, energy, food safety, and environmental science, and among many others. Thailand recognizes the importance of nanotechnology development and its impact to economic benefits. However, at the same time Thailand cannot turn a blind eye to the potential risks associated with the utilization of nanotechnology. For this reason, the National Science Technology and Innovation Policy Office (STI) have included in the its National Nanotechnology Policy Framework 2012-2021 the Nanosafety and Ethics Strategic Plan. The first Nanosafey and Ethics Strategic Plan (2012-2016)was approved by the Cabinet in 2012. 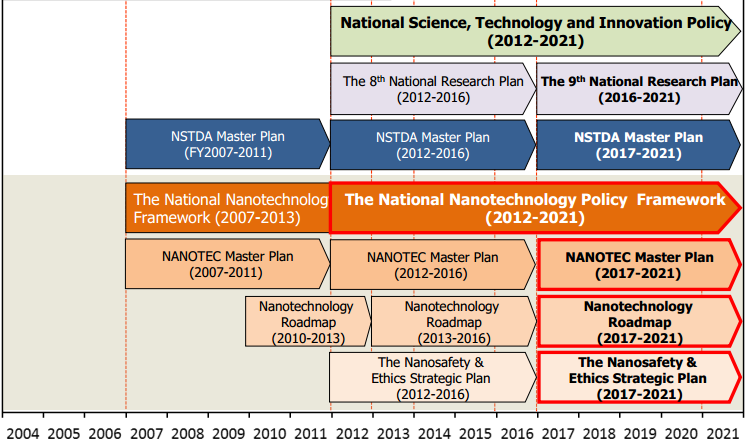 The follow up Nanosafety & Ethics Strategic Plan (2017-2021) is currently with the National Science Technology and Innovation Policy Office (STI) for final reviewed. It is expected that the review process and final approval of the plan will be finalise end of 2017. The aim of the Nanosafety and Ethics Strategic Plan is to manage the unity and define the directions for nanotechnology precautions and ethics in order for institutions to synergize and compliance with strategic plan accordingly. Given the fact that NANOTEC is a research agency, it will concentrate its effort in promoting public engagement, awareness, and research of nanosafety related topics to the general public and industrial sector. 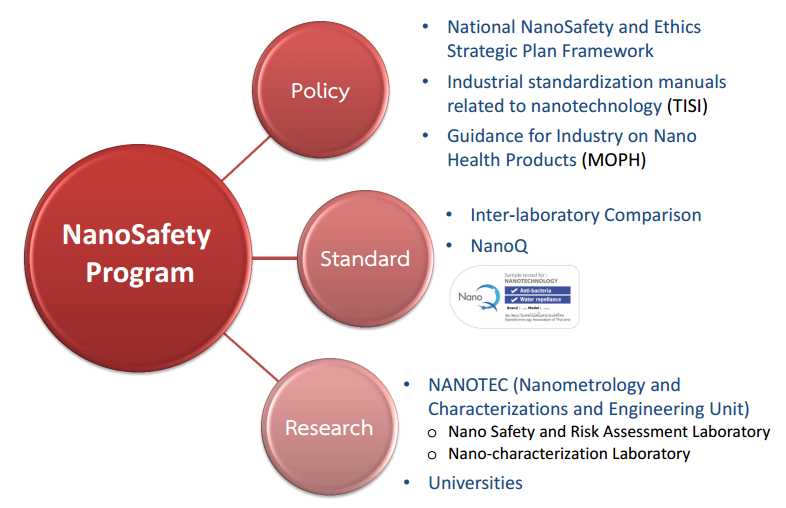 The NANOTEC Nanosafety Awareness initiative educate and engage identified stakeholders in the knowledge of nanotechnology and safety issues associated with nanotechnology. Organizing scientific workshops, forums, panel discussions, and exhibitions have been the implemented to promoting public awareness. NANOTEC for the past 2 years (starting in 2014) have collaborated with the NANO Plus+ Center and TTN (Training of Trainers on Nanotechnology) members to include aspects of nanosafety in their workshop program. To date, over 15 workshops in which some aspects of nanosafety have been conducted to students, community representatives, and local administration officials. 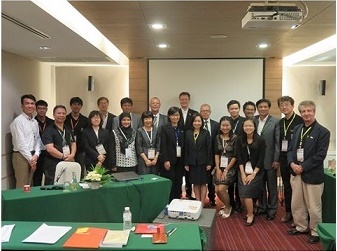 The topic of Nanosafety was also included as a concurrent event during NSTDA Annual Conference in 2016 (NAC 2016) which was held from March 31-April 2 at Thailand Science Park. NANOTEC teamed up with NANO Plus+ Centers and TTN to organized the panel discussion session on “Integrating Public Awareness of Nano Safety Education in the 21stCentury”. In recent years, NANOTE have increased its public engagement activities in nanosafety awareness to focus on providing training to companies that are using nanomaterials in their production process. In response to recognition for the need to build public awareness, NANOTEC is participating in the NSTDA On-Line Learning Project (NOLP) to include nanotechnology and nanosafety courses in the project. A total of 16 courses is scheduled to be on-line soon and two of the courses will be dedicated to n anosafety. The courses can be viewed at the following link: https://mooc.learn.in.th/. Currently the courses are in Thai. Originally started as a royal initiative by H.M. King Bhumibol Adulyadej implemented by the Distance Learning Foundation, the e-Learning project has opened up education opportunities to students from all corners of the country since nearly two decades. Classes at the Klai Kangwon Palace School, Prajuab Kirikhan Province, are broadcast via satellite to the televisions in all households of Thailand. It is considered a new platform for utilising ICT as a tool for E-learning in remote areas. Currently HRH Princess Maha Chakri Sirindhorn is the patronage of this royal project. 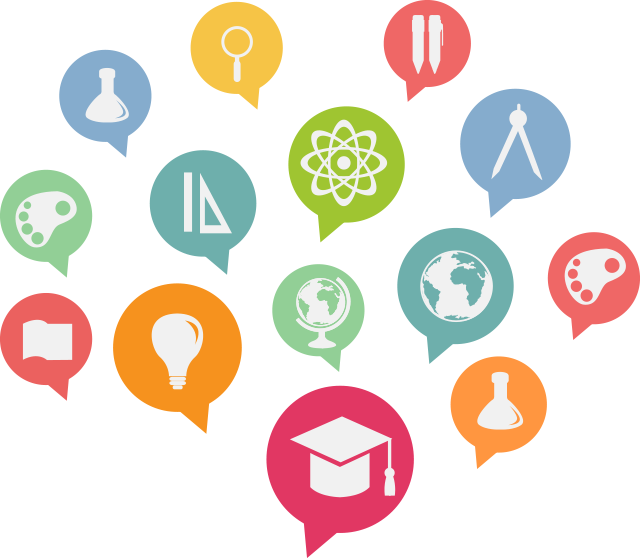 NSTDA and its research agencies are participating in this project by providing on-line S&T learning in 4 research topics: Biotechnology (BIOTEC), ICT (NECTEC), Material Science (MTEC), Nanotechnology (NANOTEC). NSTDA S&T courses are currently being VDO and taped for uploading to the Massive Open Online Courses (MOOC) network. Development of teaching communication and services. Water, roll on the lotus leaf . What is nanotechnology: size of nanometers . The synthesis of nanoscale products: synthetic nanoparticles to test for lead . The camera and the benefits of AFM. The carbon nano: a structural model of Fullerenes . Carbon nano- structure: models diamond structure . Why Nano? optical properties of gold nanoparticles in solution . The safety of nano materials and products . With the successful launch of Nanotechnology Association of Thailand on October 7, 2010 the association is giving top priority to pushing the voluntary implementation of NanoQ label which is the country’s first industrial standards certification for nanotechnology related products,. NanoQ covers 3 consumers products: textile, paints/coating, and household goods. Certification mark plays an important role in the commercial sector. It acts as evidence to the existence of follow-up agreements between manufacturers and nationally-accredited testing and certification organizations. With the increase of new nano-enabled product in the market, nano mark certification will be an important factor to encourage domestic manufacturers to develop prominent nano products and promote consumers’ acceptance of nano products. The Nano Characterization Lab (NCL) and Safety and Risk Assessment Lab at NANOTEC are two of the testing centers that is participating in the certification process. Local companies in Thailand who wish to obtain NanoQ label can forward their request to the Association, who will further work with National Nanotechnology Center (NANOTEC) to have the product tested. A yearly auditing process is also part of the NanoQ label package. To date, 7 NanoQ labels have been awarded to 7 companies with several more waiting in the pipeline. 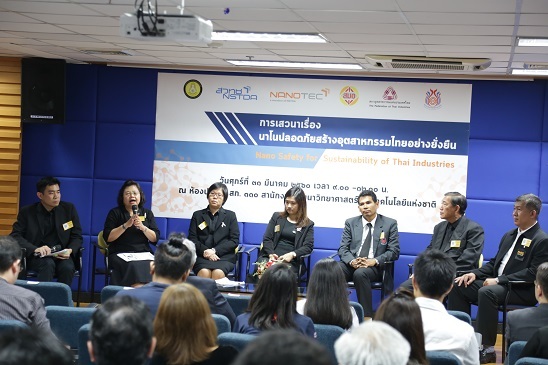 The Royal Thai Government Gazette have officially announced the 7 industrial standardization manuals related to nanotechnology. 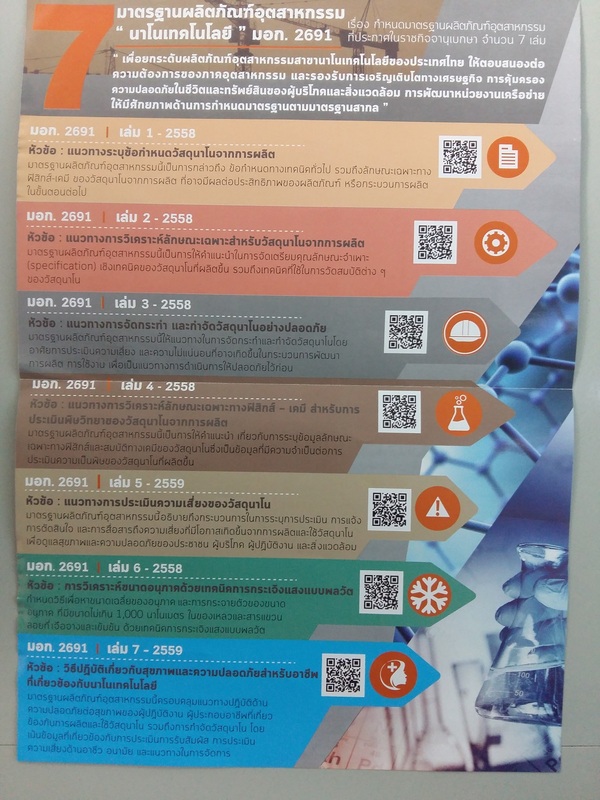 To help promote the utilization of the existing 7 industrial manuals, the Nanotechnology Association of Thailand have decided to incorporate information from the manuals as part of their NanoQ label application process. Companies wishing to apply for NanoQ label will need to adhere to the manual guidelines. Given the detailed technical information in the 7 manual it is unlikely that the manual will be reviewed by the industry personnel therefore, to help solve this constraint, NANOTEC is working to publishing a “friendly to read” version of the 7 industrial manuals which is expected to be completed middle of 2018. The Nanometrology and Characterization and Engineering Unit at NANOTEC is the key unit responsible for providing research and development in the field of nanometrology, nanosafety, nanoscale testing, including characterization of nanoproducts properties, and engineering prototype development. The Nano Safety and Risk Assessment Lab (SRA), Nano Characterization Lab (NCL), and Engineering and Manufacturing operate under this unit to provide research and development project catered to the industrial sector via the use of models and advance nanotechnology instruments. Research project in the past included, nanoparticle-coated fabrics under development were subject to wash-water contamination tests. Nano-titanium dioxide (TiO2) coated fish tanks were tested for toxicity to fish. Skin creams containing titanium dioxide nanoparticles were also tested for skin penetration through a model (pig) skin. Ecotoxicity of nanosilver in waste water was also tested. 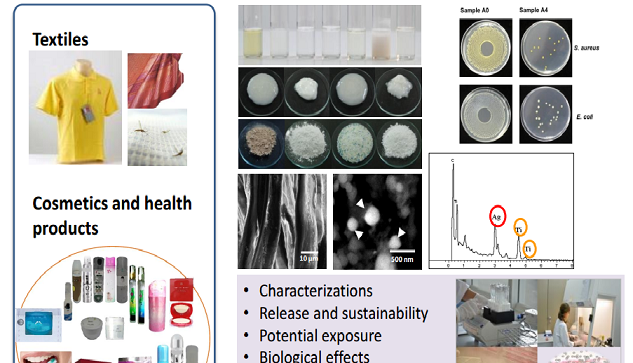 More comprehensive nanomaterial safety data resulting from Nano Safety and Risk Assessment Laboratory (SRA) of NANOTEC which specifically addresses on two main areas regarding safety investigation of nanomaterials: Human health and the Environment. Currently, the effects of three nanomaterials, Ag, TiO2, and Au, have been investigated. The newly established National Advanced Nano-characterization Center (NANC) is now operational and the Nano Characterization Lab (NCL) is currently taking the leading role in managing the center. In addition NANOTEC and National Institute of Metrology (NIMT) have collaborated since 2010 to form the country’s first research collaboration to provide quality infrastructure in areas related to nano-scale measurement, calibration, and nanometrology. Asia Nano Forum (ANF) is a network organization, founded in May 2004 and now a registered society in Singapore, known as Asia Nano Forum Society, since Oct 2007. ANF aim to promote responsible development of nanotechnology that educationally, socially, environmentally and economically benefits each economy by fostering international network collaboration. Currently there are 17 member economies and Thailand is one of the member economy. 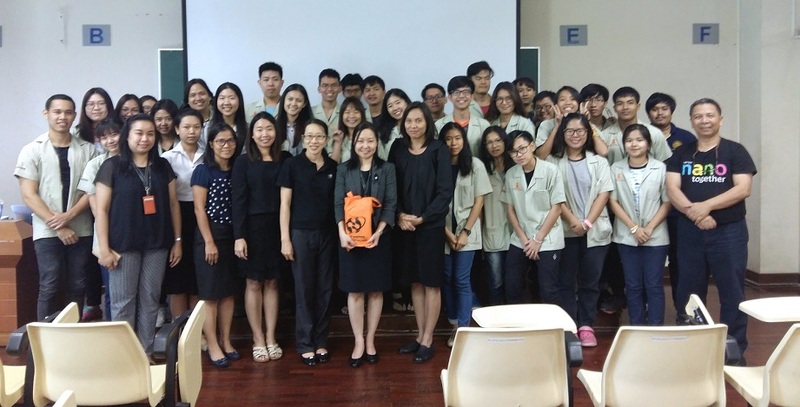 The are two contact points for ANF in Thailand; NANOTEC and King Mongkut University of Technology Thonburi (KMUTT). NANOTEC works closely with the ANF Nanosafety Working Group in the area of public awareness activities. In 2016 ANF and NANOTEC co-hosted the Nanosafety Seminar 2016 as part of the NanoThailand 2016 technical program. Speakers from Japan, Korea, Malaysia, Singapore, Switzerland, Taiwan, Thailand, and the United States participated as speakers in various nanosafety related topics from country policy to specific research projects. Due to positive comments from participants both ANF and NANOTEC will again organize a nanosafety technical forum during NanoThailand 2018 in Bangkok. NanoThailand 2018 will be organize by Chulalongkorn University. 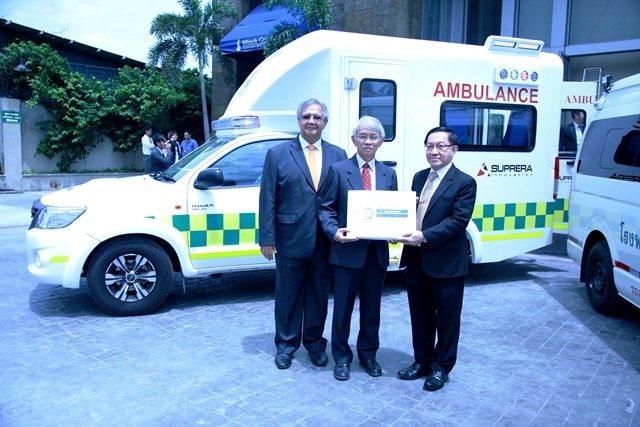 In 2011, NANOTEC and UNITAR signed a Collaborative Agreement to implement a Training and Capacity Building for the Development of the Nano-Safety Pilot project in Thailand (phase 1). The first training workshop was the Nano Inception/Awareness Raisi ng Workshop which was held in 2012 in conjunction with NanoThailand 2012 conference. 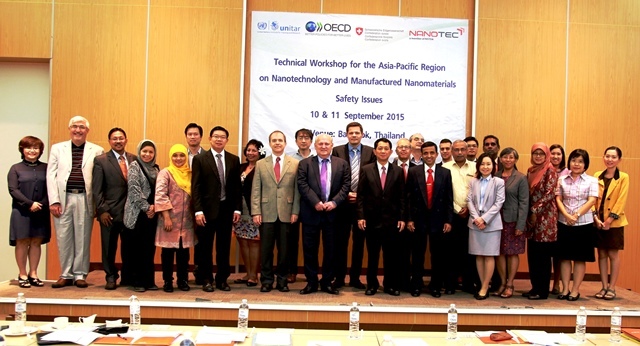 Since then several regional workshops have been initiated under this collaborative umbrella including the recent workshop being the Technical Workshop for the Asia-Pacific Region on Nanotechnology and Manufactured Nanomaterials: Safety Issues which was held on 10 & 11 September 2015 at Thailand Science Park in Pathumthani province, Thailand. The Organisation for Economic Co-operation and Development (OECD) is an intergovernmental organization playing a significant role in the regulation of chemicals through its Environment,Health and Safety programme (EHS). The OECD is the place where member states come together to, among other things, agree and validate test guidelines and Good Laboratory Practices (GLP) for chemicals (including nanomaterials). Data produced according to these guidelines benefit from the Mutual Acceptance of Data (MAD) mechanism among all states that have signed the MAD agreement. These validated methods are then integrated in regulatory risk assessment processes all across the OECD states. The total number of OECD member countries total 35 countries. 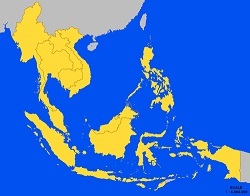 Thailand is considered one of the “observing country”. Other observing countries are Malaysia, Indonesia, etc. The OECD created WPMN in 2006 to promote international cooperation in human health and environmental safety in manufactured nanomaterials through the work of several steering groups (SGs). The WPMN brings together OECD member countries and several non-member partners, including Brazil, Thailand, China, South Africa, The Russian Federation, as well as intergovernmental organizations (such as UNITAR, WHO, FAO, and UNEP) and delegation from industry , Trade Unions , and Environmental NGOs. Observers can participate in all aspects of the work of the WPMN and its steering groups. 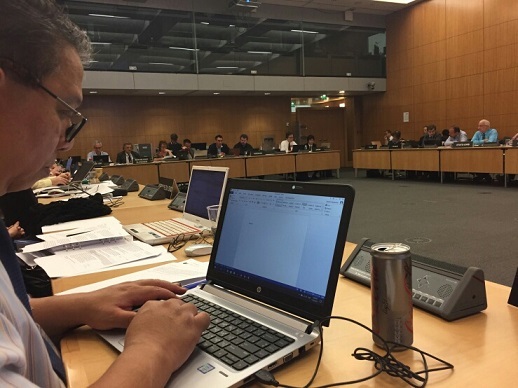 NANOTEC representative(s) have participated in the OECD WPMN annual meetings since 2011. In each of the organized meetings, Thailand have submitted and presented the Thailand Country Report during the meeting. 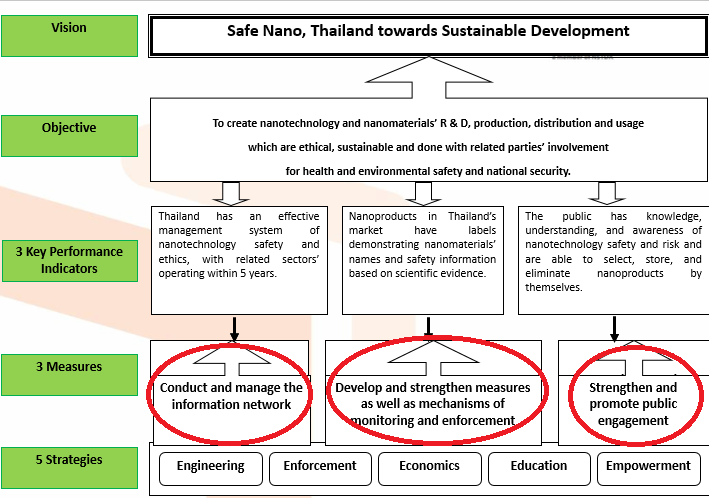 The country report outline the various activities that Thailand have implemented or initiated in the area of nanosafety and policy initiatives. Thailand have proposed to be a “Sub-regional Hub in Nanosafety and Nanotechnology” in ASEAN in order to further strengthen our collaboration among neighboring countries as well as developed and developing countries, in which ris k management and public awareness will be promoted. In May 2016, representatives from NANOTEC and the Chairman of NanoQ label were invited to participated as invited speakers at the 2 days workshop on “Training and Capacity Building for the development of nanosafety pilot project in Vietnam”. The workshop was organized by the Vietnamese Pollution Control Department (PCD) together with the Swiss Confederation and UNITAR. Also on May 17-19 2 NANOTEC representatives were invited to join the nano event in Iran to present on Thailand nanosafety initiatives, policy, and labeling. We are committed to working with SAICM to achieve the 2020 goal of sound chemical management and we believe that Thailand can play an important role in moving forward the development of nanotechnology in the sub-regional and global arena.